A Malaysian-born, Glasgow-based author, whose first novel has been much applauded, tells of her road to literary fame. “THE INSTINCT of storytelling came to me very early,” says Chiew-Siah Tei, whose first novel, Little Hut of Leaping Fishes, was longlisted for the inaugural Man Asian Literary Prize while still in manuscript form. 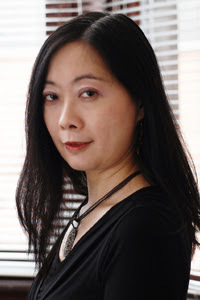 Malaysia-born author Chiew-Siah Tei read a lot as a child and then began ‘creating’ her own stories. The novel, now published by Picador, was launched at The British Council [in Kuala Lumpur] on June 26 (ahead of its British launch on Friday) in an event jointly sponsored by book distributor, Pansing Marketing. This is not the first time that Tei’s storytelling has received international recognition. She has won a series of awards for her short fiction written in Chinese, including the Hua Zong International Chinese Fiction Award. Her film Night Swimmer won the best short film at the Vendome International Film Festival in 2000, and her first play, Three Thousand Troubled Threads, was performed at the Edinburgh Festival in 1995. Tei, one of seven children, grew up in Tampin, Negri Sembilan. With three generations living in one small shophouse, the rather sensitive child says she found peace and refuge at a neighbour’s house. The couple were former teachers and fed her imagination with picture books. She devoured the fairy tales of Hans Christian Andersen and Oscar Wilde’s The Happy Prince. “After reading so many stories you start to create your own,” she says, and in this she was greatly encouraged by a teacher who took her under his wing. “When I was 10 years old, the teacher began to teach us composition in the Chinese school. I wrote my first one and he liked it and asked me to copy it down on proper paper. Then he sent it to a Chinese newspaper which had a children’s section and it was published. She took up a course in media studies and film at Glasgow University in Scotland in 1994. When she attended a screenwriting workshop organised by the BBC (British Broadcasting Corporation), she became interested in the marriage of film and writing. She embarked on a cross disciplinary PhD, marrying creative writing and film studies. Tei credits her professors at Glasgow University (including renown Scottish novelists Alasdair Gray and James Kelman, as well as poets Tom Leonard and Liz Lochhead) with having given her the confidence to move on with her novel. However, life was far from easy—she had to work part time to support herself and is ever so grateful to friends and family members in Malaysia who helped her. Completely out of the blue, she received an email from literary agent Toby Eady (who has a passion for Asian writing and is now publishing consultant to Pan Macmillan’s new Hong Kong-based imprint, Picador Asia) who wrote to ask if she could send him some samples of her work to read. A friend of Tei’s had sent him a copy of her film. “At that time I didn’t have anything,” she says, “But I began to keep in touch with him and when I finished the novel in March last year, I sent it to him. He got back to her in four days and the first thing he said was ‘It touched my heart.’” Eady signed her up. So will she remain an author or return to filmmaking? Tei says that she doesn’t know yet; she is writing full time now but it could all change again. She does not rule out a return to writing in Chinese again either. The novel’s title refers to a small house set in a courtyard in the town where the main protagonist, Mingzhi, lives during his studies. The novel weaves in real events taking place in 19th-century China so he is not just a witness to history but part of it. At the end of the first book, he sets sail with his friends for the Malay peninsula and a new beginning. The first sequel is set in the first part of the 20th century and sees Mingzhi having to make a new home in the new land. The third book in the series will be set between the 1990s and the present. “It will redefine the concept of home in modern society when everything is moving so quickly and people become so busy,” the writer says. When I ask Tei where home is for her, she laughs. She says that she has visited China, but found the people and language there very different. She finds Glasgow very difficult because she misses her friends and still feels an outsider there, and yet feels like a tourist when she comes back to Malaysia. But the launch in Kuala Lumpur was thronged with book lovers as well as friends and family who came out in force to welcome this Malaysian storyteller home. Congratulations, Chiew-Siah, on your first novel! I look forward to reading more!